While most Israelis do not like Arab List’s politics, they’re enthusiasm this year is a good sign for integration. The Joint Arab List has changed Arab Israeli perceptions of their opportunities in Israeli politics. While some on the right-wing might not be thrilled with the challenge the slate could be in the Knesset, it is also a sign that Israeli Arabs have actually begun to see Israel's democracy for what it is: democratic. In a recent survey of Arab public opinion conducted by Tel Aviv University's Itamar Radai, he found some notable statistics that show several positive trends such as that Israeli Arabs are more enthused by what Israeli democracy has to offer. The majority of Arabs who plan to vote do not see the Peace Process as the top priority for their community - that's a distant 3rd place on the list. The issue that most concerns over 44% of those surveyed is the 'Civil Agenda' - economics, unemployment, education, violence in their communities and the rights of women. And while these issues all have specific meaning to the Arab community in Israel that they do not among Israeli Jews, these reflect the general Israeli trend to focus on domestic issues rather than diplomacy and security. "Specifics speak to the Arab community like unemployment, women's rights in the Arab community and violence we are seeing in the Arab community, says Radai. Yet, "the Civil Agenda has components that might speak to everyone in Israel." Discrimination is still a major priority for Israeli Arabs as they see it - it is the #2 issue for the community. If it were not for the perception they face discrimination from the state or prejudice on the street, such a dysfunctional combination of Arab parties would probably not have succeeded in creating the Joint List. "Part of the time they are part of the general trend of the Civil Agenda, but they have their own special problems in their view which are their priorities." East Jerusalem Arabs are not citizens of Israel. They can apply for it, but many have chosen not to do so. 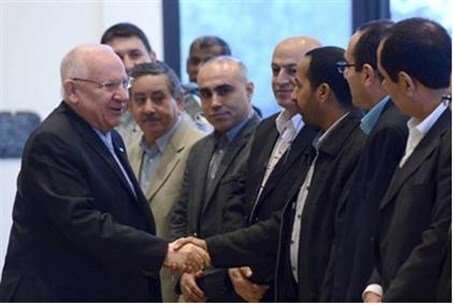 Arutz Sheva asked Dr. Radai if he felt the Joint List might also entice East Jerusalemites to apply for citizenship and attempt to have influence on Israeli politics. Dr. Radai felt this was an impossibility. "They have a separate political agenda," explains Radai. "In recent years there has been a trend of more East Jerusalemites asking for citizenship," but given the tensions over the last few months and how East Jerusalem Arabs have perceived the reaction of the authorities and the municipality "this trend might even come to an end." As for the Joint List itself, "Most Arabs in East Jerusalem did not even hear about it. For those that did, they did not care so much. They have their own agenda and arena." There is also a balance with the Israeli Arabs on the Joint List. The Joint List is against annexations and favors a Palestinian state with East Jerusalem as its capital. So even if the Joint List wanted to comment about issues East Jerusalem Arabs have with the Jerusalem municipality, they will not. They do not want to make people think they are compromising on the role of Israel in East Jerusalem. But there are Israeli Arabs from other communities who have moved to Arab neighborhoods in Jerusalem. At this juncture, does Dr. Radai see a chance that their presence might have an impact integrating East Jerusalemites into Israel's political scene? "There is a group of Arab elite residing in Jerusalem - some in the West, some in the North in the well-to-do neighborhoods. They are part and parcel with the Arab Israeli community, but they are politically completely separate from the other Arabs in the city." The wars in Syria and Iraq are reinforcing Druze and Arab Christian identity in Israel, according to a post by Dr. Radai on the Moshe Dayan Center’s website. Counterintuitively, Christians and Druze are less likely to vote next week than Muslims according to another poll by the Yaffa Research Institute. "For the Druze it's probably for many reasons," says Dr. Radai. "There could be a lack of general interest. It could be there's no Druze list in the campaign. Another reason might be frustration among a population who tend to be pro-Israeli or pro-Zionist and are perceived as Druze in the IDF but as just 'Arabs' in civilian life." Whatever the reason, it is something that has likely gone under the radar for Israeli Jews who are so used to hearing about Druze acceptance of an equal share of the burden in terms of the draft and civil service. Several of those police officers injured or killed in recent Jerusalem terror attacks have also been from the Druze community. Another reason Israelis might not have noticed this low turnout is because the statistic that is more common to hear is that Druze are far more likely to vote for Jewish-majority parties than Arab ones. Additionally, Druze have had consistent representation in recent Knessets, as from Hamad Amar of Yisrael Beytenu or Ayoob Kara of Likud. On Christians, Radai saw them as "in between Druze and Muslims. Most don't serve in the IDF but some do go in voluntarily." As to why they seem be more likely than the Druze but less likely than Muslims to vote next week, Radai could not help but consider the tribulations of Christians in other Middle Eastern countries. "It might be due to changes that are transforming the community in Israel in conjunction with changes going on throughout the region. The civil war in Syria and the ISIS war in Iraq are also influencing Christians here." But what Israelis should probably appreciate most about these two minorities within the greater Arab minority is that they are being socially pulled in multiple directions. "There might also be some embarrassment or confusion which leads to a lower percentage of voters. They are torn. Many see themselves as Arabs, but recent changes (in the Middle East) are making Christians feel much less inclined to identify as Arabs or Palestinians (in Israel). There is no Christian party running for the Knesset, but there are candidates on the (Arab) Joint List. The relatively lower percentage might be due to this confusion."